HETAUDA, May 26: Bimala Majhi is already 40. Learning to build house at this age was not something she ever imagined of. If it was about contributing labor, it would still be a normal thing, she said. “But we are now working as trained masons. It is very a tedious job but it feels great doing it,” she added. Chandra Kumari, 28, has learnt it, too. Learning to instruct on building a house has given her the feel of a leader, she noted. “We women are doing both things here. From small to big, we have shouldered all the construction responsibilities,” she added. Post earthquake, reconstruction became the most heard term in the country. However, even after two years of the disaster, few of the quake victims have received proper shelter. 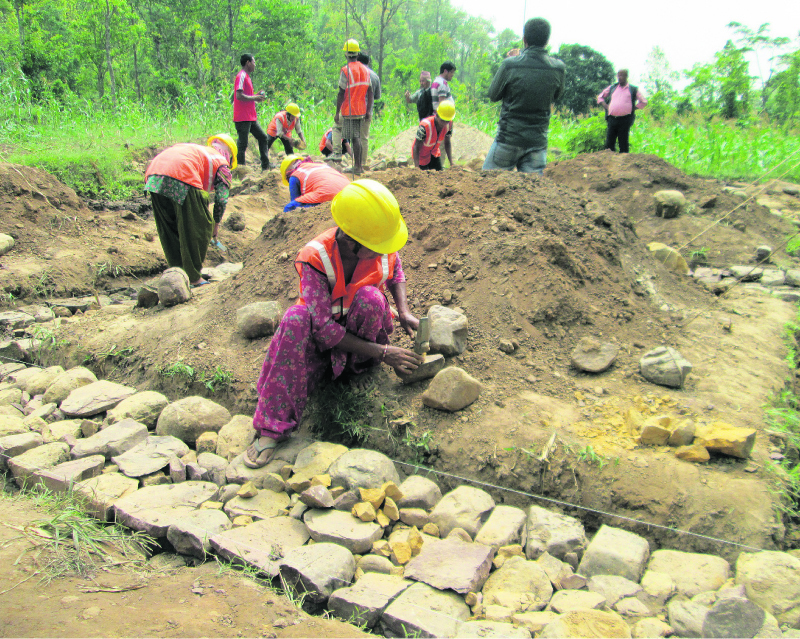 Among others, lack of trained human resource has been blamed for the slow pace of the reconstruction process. The government, with support from several non government organizations, had been providing professional construction training to interested locals. Some women from Hetuada are among these recipients. In the eastern part of the district, women geared up in yellow construction helmets and orange jackets give the construction site a professional look. They are found busy in several construction sites where houses for earthquake victims are being built. “We are erecting wall now. The foundation was laid down a couple of days ago. We are making our own and other’s house, too,” said Bimala. It feels great to serve for free, she remarked. Narwada Ghimire is another skilled mason who is extremely happy to do what is culturally considered a ‘men’s job’. She is 38 and feels that the new role has made women as important as men. “Our society had never seen women working as mason earlier. Now it can see that the women can do everything. We are both labors and masons,” she said. Narwada, Chandra Kumari and Bimala were busy building houses at Bakaiya town of Hetauda. They said that they have taken over the profession both willfully and forcefully. “Women and children are at home, but our men are in Gulf countries,” said Narwada. “As they are earning for the family abroad, there is no one to build our houses and thus we had to learn to do it. Now we feel that it is a matter of pleasure that we are able to do it on our own,” she added. Narwada further shared that there was somewhere an ‘ego’ factor behind women’s intense eagerness to get involved in the reconstruction work. According to her, husband of many women who have been working abroad laughed at their interest to build house on their own. “Can women do it?” She quoted her own husband as saying over phone. “When they joked and laughed at the very thought of women taking over the construction responsibilities, we wanted to do it more than ever,” she said. She said that being able to work and earn at one’s own home is far better than flying abroad in search of job. “This kind of skill is always sellable. We are doing it now as social work. We have been helping quake victims like us. But we know that our demand is going to be more than ever in the days ahead,” she said, confidently. Bimala shared similar sentiments. She said that the women who have been working as masons as well as labors are learning so much that the experience is going to fetch better earning opportunities in the future. 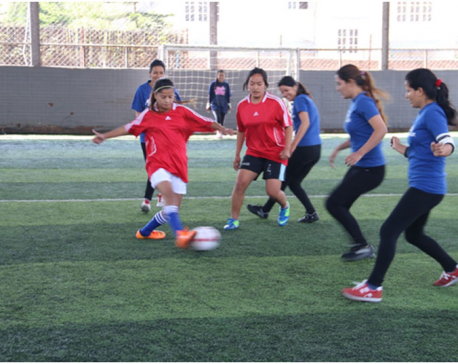 “The trainers say that there is always shortage of skilled labor in the market and if we hone our skills, we can earn well in the future,” she said. Samjhana Thing, 22 and Sumitra Ghalan, 24, of the same town are also receiving the training. Both had dropped out of school after 10th grade due to financial problems. “We could not study further as we could not afford it,” said Samjhana. She is now very happy to receive the mason training. “I feel that my family is financially secure now. Here, people are poor. So they cannot pay much for our services, but elsewhere we can earn good money,” she added. Sumitra is of the opinion that house of earthquake victims must be built generously. “They should be charged modestly as they cannot pay much,” she said. Some locals remarked that women have been actually better masons than men. According to Motilal Sigar, a resident of the same area stated that women are more careful and sincere in their job. “They can be trusted. They are more sincere,” he said. “They have impressed us. They are doing great job as masons. Even as labors, women are more reliable,” he added. Over 600 people have received mason training so far and more are on the way, Suka Bahadur Chaudhari, coordinator of the training program informed to Republica. “Among those 600, over 100 are women as its mandatory that at least 30 percent of the trainees be women,” he said.